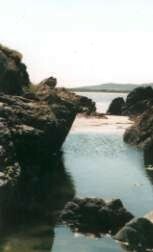 Balephetrish was unique on Tiree as it had never been divided into crofts or occupied by the runrig system until after the 1914-18 war, after which time it was allotted to ex-servicemen on the "Club System". 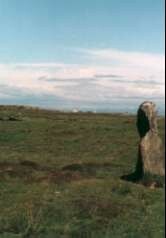 Balephetrish has the notable Ringing Stone, Clach a' Choire, on its shores. When struck with a stone or pebble, this Ice Age erratic produces a ringing tone. According to Ludovic MacLellan Mann, the cup markings on its' surface are according to a system which can be traced throughout the world, older than the druid religion which came before the Christian teachings. 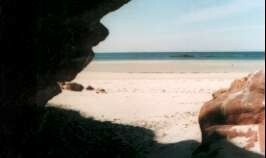 Also at Balephetrish, is a rock formation, known locally as the Mermaids castle and natural pink granite arch which provide hours of beach fun for youngsters and the young at heart. Other interesting features of Balephetrish are a well on the top of Balephetrish hill; hewn out of rock with steps leading down into it, on the northwest slope of the hill and old quarry from which a Belgian company worked to extract marble, pinkish with green speckles, for a short time before the great war. DunTaek is located on the top south westerly shoulder of Balephetrish hill. At the east end of the hill, is a gentle slope called Circnis and Ardcircnis where there was a suggestion of a church called St Finans. There are a few large stones which may have been a possible circular building, but no evidence remains. However, there is a St Finans which has been authenticated in Kenovay. It is suggested that the Arcircinis mentioned was really the monastery founded by Findchan at Artchain (Gentle Height) which was mentioned by Adamman in his "Life of St Columba". Findchans monastery was reputed to have been founded in 565 A.D.
Today Balephetrish is a collection of a few pristine whitewashed houses and the land is farmed.